Activate Override default WP emails from User Meta >> Add-ons menu by turning on the respective box’s switch. Go to Override default WP emails >> Options. There you will get two different checkboxes. 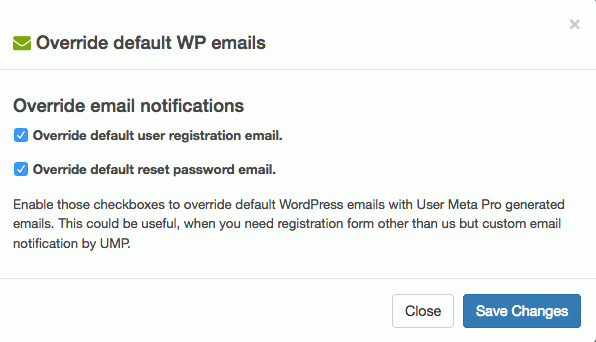 Enable those checkboxes to override default WordPress emails with User Meta Pro generated emails. This could be useful, when you need registration form other than UMP but custom email notification by UMP. Enable Override default user registration email checkbox to override default WordPress user registration email with User Meta Pro generated email. Disable it and you are going back to WP default email. Enable Override default reset password email checkbox to override default WordPress reset password email with User Meta Pro generated email. Disable it and you are going back to WP default email.